Adapted from Steamy Kitchen, adapted from Rose Levy Beranbaum, adapted from Mark Bittman of the New York Times. 1 1/2 cups warm bottled water, about 100 degrees F.
Mix all of the ingredients together in a bowl, cover with plastic wrap, and leave out at room temperature for about 12 to 20 hours. 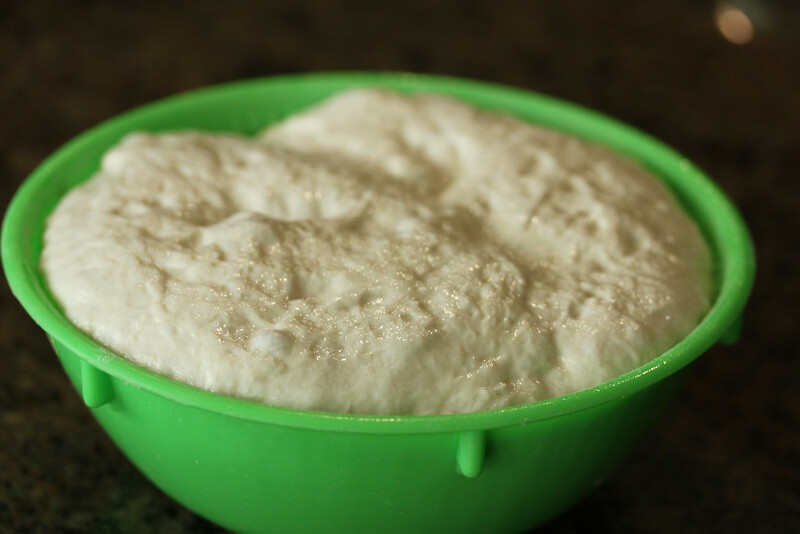 Using a dough scraper, spatula, or bench knife, dump the dough out onto floured surface. Wet your hands and your dough scraper and stretch and fold the dough into a ball of sorts. Imagine grabbing each side of the bread blob as if it were an envelope and folding it from the bottom to the middle from all four sides. The scraper and your hand should be wet so you don't stick. Spray a bowl with spray oil and sprinkle with flour. Place your ball in it, seam side up. I use rice flour on my bowl because it is like Teflon. Spray the top of the dough with spray oil and cover loosely with plastic wrap. Let it sit for two hours. Place a large cast iron Dutch oven in the oven and preheat to 450 degrees. Remove the Dutch oven from the oven and carefully dump (so you don't burn yourself) the dough into the pan, seam side down. If your bread lands oddly, don't worry, it still tastes great. Cover and return to the oven for 30 minutes. 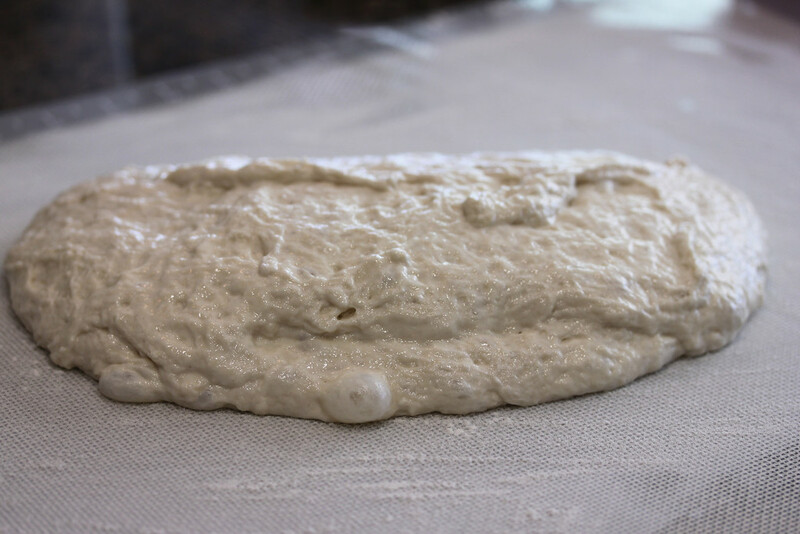 Uncover and bake for 15 to 20 minutes more, until the interior of the bread reaches 210 degrees. Cool on a wire rack. Do not cut into it immediately as much as you would like to or it will not be finished cooking and may be gummy. 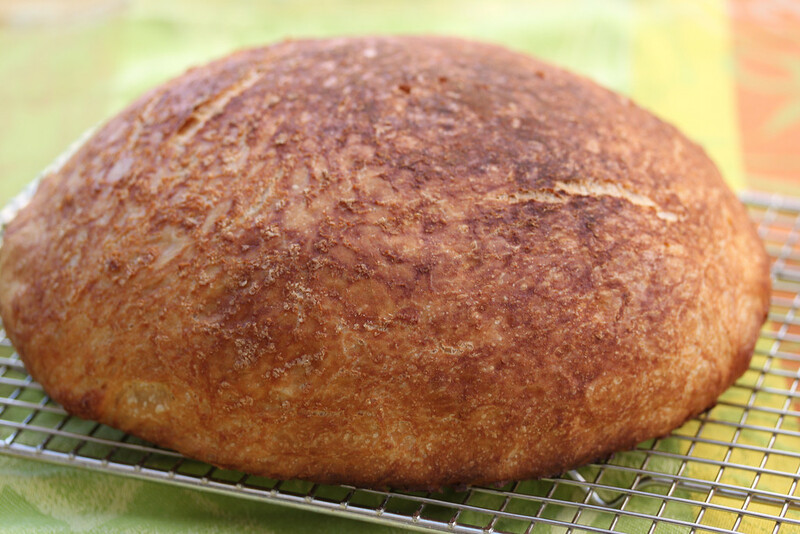 If you want warm bread, reheat in a 350 degree oven for 10 minutes before serving. Look at this gorgeous interior. Thanks for sharing.......looks wonderful..............I sent this website off to a few of my friends!!! Looks very nice! 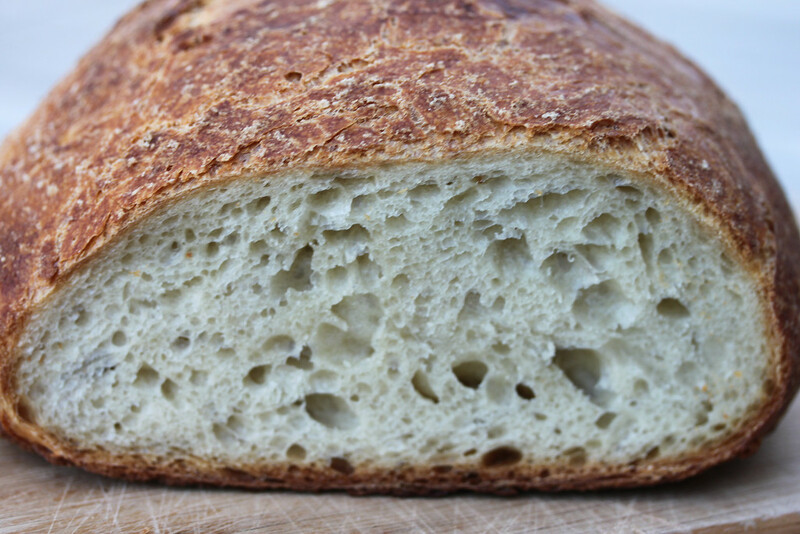 I use SAF Instant Yeast for all my commercial baking, too. It's great stuff. So dependable. Bought bread flour and a cast iron dutch oven. Ready to make bread!! Saw the last week and I was really excited- it looks fool proof. Can't wait to try it out on Emily. It was terrific! So yummy. Going to have to do that again. Thanks for the inspiration.